Carnahan & Sons, Inc. | A family farm in southern Indiana. Last week we were able to apply the herbicide to the wheat crop. Conditions were not perfect, but okay. At least, we now have that one urgent task checked off the list. Yes, it is sunny and windy out there today, and it is drying the soils out nicely. But still the machines are parked. We wait for (not perfect but) better conditions to begin field operations. All the tractors are ready. John is out now loading the water tender truck with soybean herbicides so that when it is possible, we will have what we need on hand. The ammonia applicators are hitched and ready to run. C’mon sunshine! 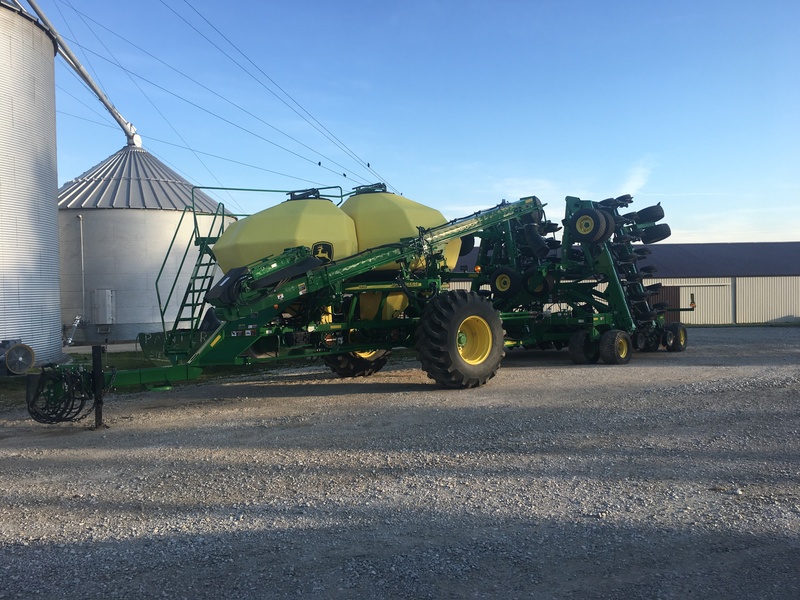 We discovered recently that we need a special upgrade to our new corn planter in order for it to communicate properly with our Fieldview information system. 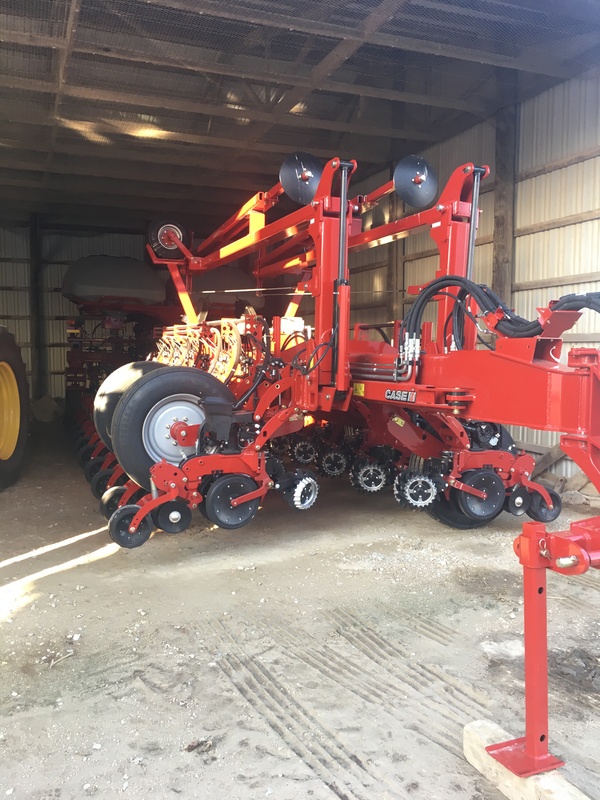 Some wiring will need to be done on the tractor and planter, along with another software update… all quite do-able, but we need to get our hands on the parts. The word ‘back-order” has been used, and that is quite concerning! This special upgrade is crucial to our planned comparison testing of prescriptions vs flat-rate corn planting. Well, we can only play the cards that are dealt to us, so we will adapt, and work in the upgrade whenever it arrives. The sun is trying to shine through the morning’s clouds. Our fields just will not support the machines…yet. So far, we are not feeling the pressure to get going… the conditions will not permit, so why fret? But it also feels like when it does get dry and warm enough, there will be MANY jobs to do all at once! I did get out on the Gator yesterday to do some burning in 3 fields of crop residues that piled up during winter’s flooding. Some locations burned well, some did not ‘take off’ very well. Drier days needed. The weather forecast predicts rain tonight and Sunday.. but the daytime temperatures are going to rise into the 70s! Warmer days will speed the drying process. This machine needs to get going soon, first with a herbicide for wheat. This planter must get in motion right away. We prefer to plant soybeans early too. Historically, Midwest farmers would plant corn first, with soybeans to follow. Now, the benefits accrue to early-planted soybeans. The grass is growing. It is interesting that we have not mowed the yard yet. We generally expect to mow once in March, so when we did not, it indicates a colder, slower start to spring. 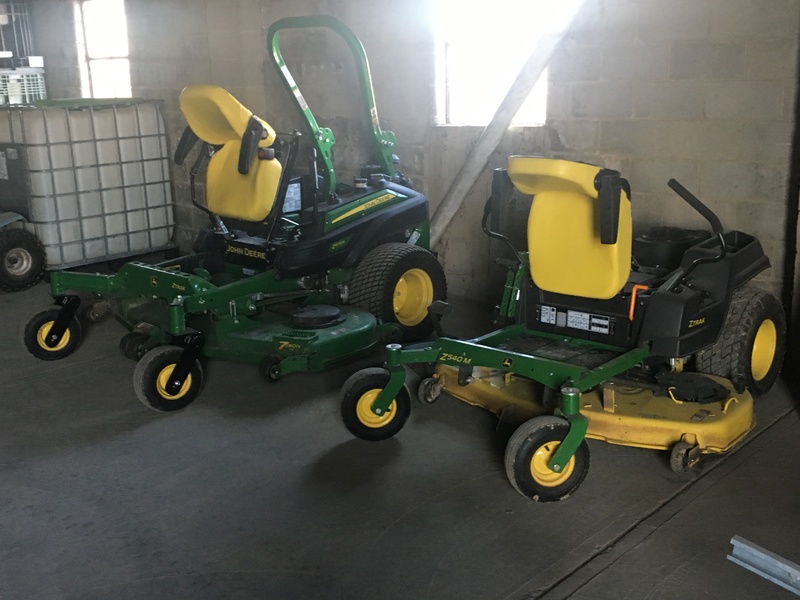 These are likely the only machines on this farm that will be put into service this week! Patience is a virtue, and it is especially helpful this week. 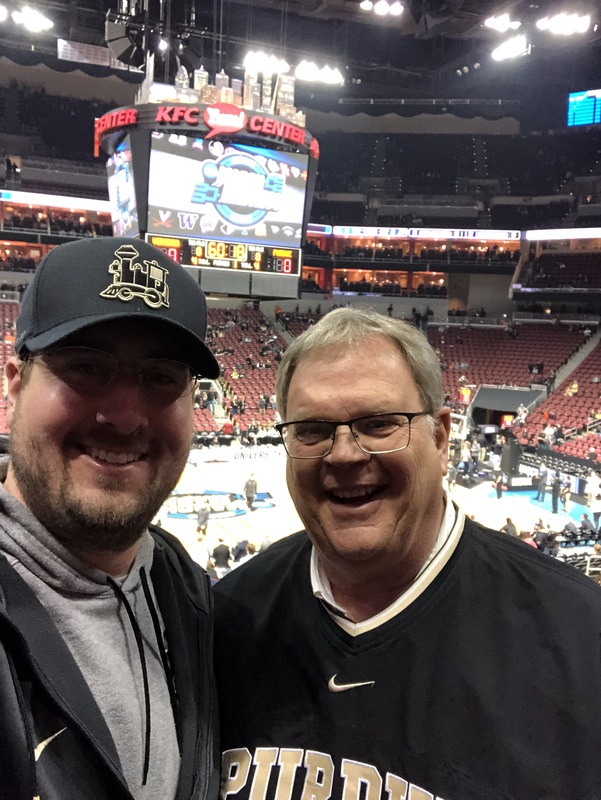 John and I traveled to Louisville on Saturday to watch our Purdue Boilermakers take on Virginia in the South Regional final of the NCAA March Madness tournament. A long-awaited berth in the Final Four was at hand! 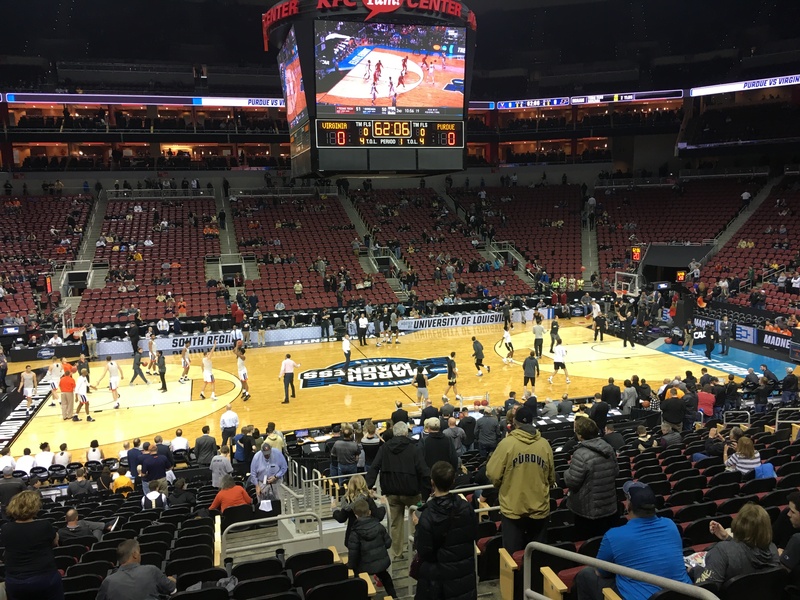 It was as if Boilermaker fans took over the KFC-Yum! Center, and we really did make it LOUD in there. It was a tremendous experience… all but the final score. 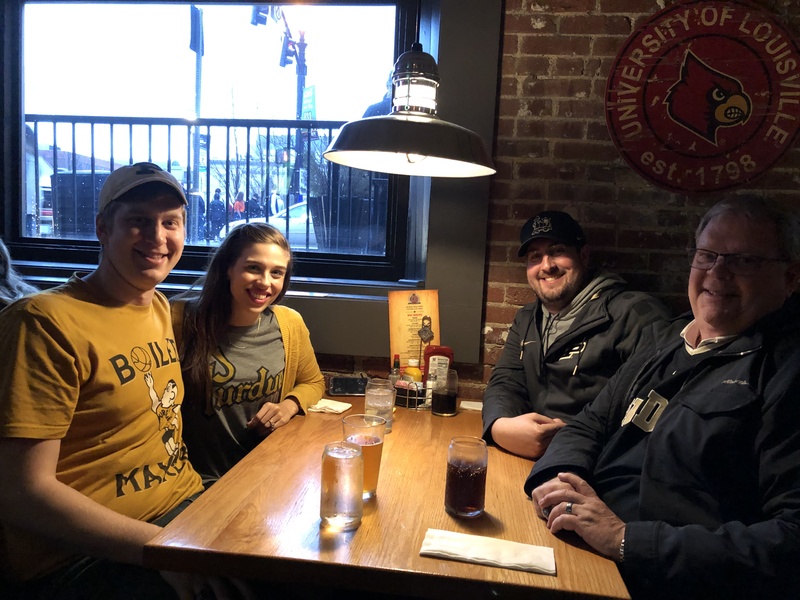 Before the big game, we met Ben and Kierstin for bite to eat. It was also pleasant to be in out of the pouring rain. We had pretty good seats, about 25 rows back of the Purdue bench. We were all smiles… before and during the game. Even without the preferred result, it was a great experience! I don’t know why we bought seats — we hardly used them — we spent most of the game standing and cheering as loud as possible for our Boilers. If you were a generic fan of basketball, not having a stake in the outcome, it would have been a fantastic game to experience. John and I and about 20,000 other boisterous Purdue fans were feeling pretty good down the stretch, and in that final minute of play, I found some tears beginning to well up in my eyes, as I dared to think that we could actually WIN this thing! Those emotions were bruised as the Cavaliers hit a last-second shot to force overtime. The OT kept our hopes alive, as the lead bounced back-and-forth. The reality of the impending loss didn’t emerge until about 20 seconds to go in OT. We had traveled to LOO-uh-vull in hope of a celebration, but the final buzzer gave the shining moment to the UVA fans. We now wax philosophically about how amazingly this Boilermaker team surpassed pre-season expectations. Picked in November as 11th-best in the Big Ten Conference, they ended as B1G Champions, and made it to the Elite Eight. Almost no one in December saw these happy results coming. There is much of which to be proud– B1G and National COTY Matt Painter, and All-American Carsen Edwards. Two special seniors who became solid contributors– one, Grady Eifert, went from freshman walk-on to senior starter. Center Matt Haarms has unlimited enthusiasm and energy. Team members express their sincere esteem for one another– how that touches the heart. Most of all, for me, I applaud the many players who express their faith in God, which will serve them well through every success and adversity. We have some special memories of Purdue basketball from this season. Saturday certainly added to those sweet memories. Those are just some of things that will keep us proud to be part of the Purdue family. And as for next weekend, best wishes to the Virginia Cavaliers as they approach the Final Four in Minneapolis. We had some rain and later some snow last Saturday. Little patches of the white stuff stuck around until today. Now, looking at the forecast, we are awaiting the 70s predicted for next weekend! Sounds good right now, as it has been 28F for the last two mornings. Because of the rain that came last weekend, thoughts of getting some field work done will have to wait a few days…again. Now that April has arrived, it adds some impetus for wanting to get going in the field. Our first operations will include applying anhydrous ammonia–our nitrogen source for our corn. Also, the wheat crop will need an application of Harmony herbicide. Speaking of wheat, it looks pretty good right now, greening up nicely from the early-March application of urea+ESN. Burndown spraying will precede the planters. It could begin to feel urgent by next week. We must remember that in 2018, we had snow on April 16th, and the result was still okay. April planting of soybeans and corn is a desirable thing, if the conditions permit. We have the CIH 2150 corn planter ready to use. The JD 1910 air cart and 1890 drill are prepared. The corn and soybean seed is on-site and ready to go. The tractors are serviced. They sit in the shed, hooked to the NH3 equipment. The JD 4730 sprayer is prepared to make its first applications. Everything is ready, except for the fields. Therefore, we say, “Come, warm and dry weather!” Patience is needed and is a special asset these days. Sunny today. Will get a little above 50ºF today. 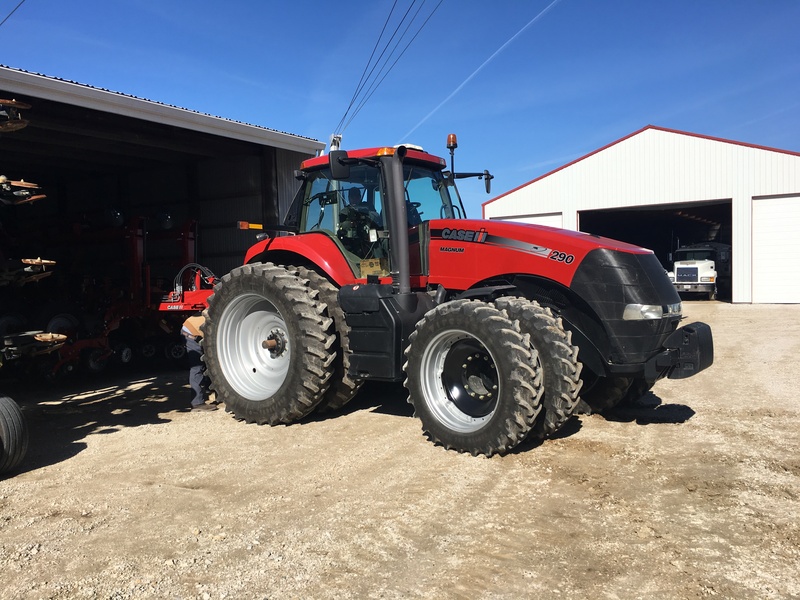 Brad is here from JL Farm Equipment, Poseyville, IN to install updated software in the MX290 tractor. This update was necessary in order for the tractor’s controller to communicate with the new CIH 2150 planter. After that update, we must load in farm-specific data so that the tractor’s control system has the appropriate information to recognize our farms, fields, operators, and hybrids. 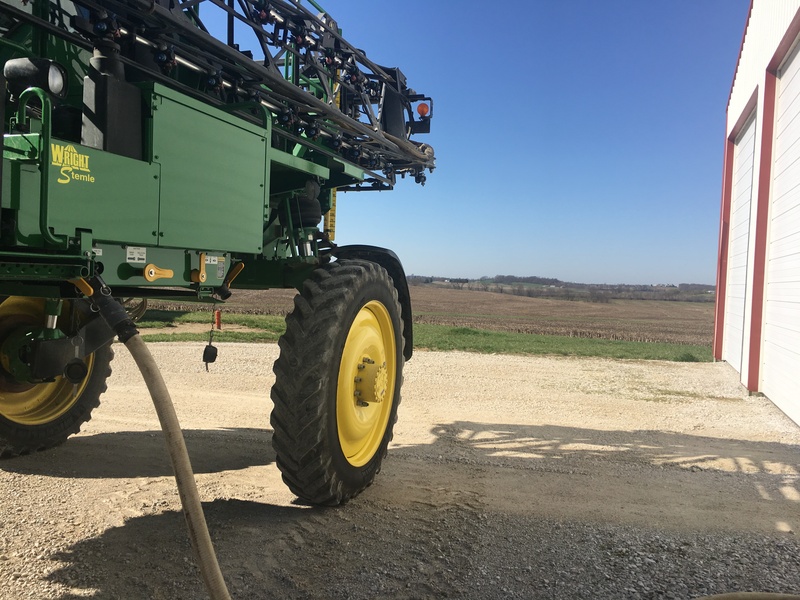 To prepare that setup info, we also performed an update to our Ag Leader SMS desktop software, and then created a Spring 2019 setup file that was loaded by USB to the Pro 700 monitor in the tractor. It feels good to have the programming completed and ready. We are also experimenting with a planting prescription, written in Fieldview. It took a couple trials to discover the format of the shapefile that the Pro700 prefers. Brad has been very helpful in getting the information that has been created in the office loaded into the tractor’s monitor. 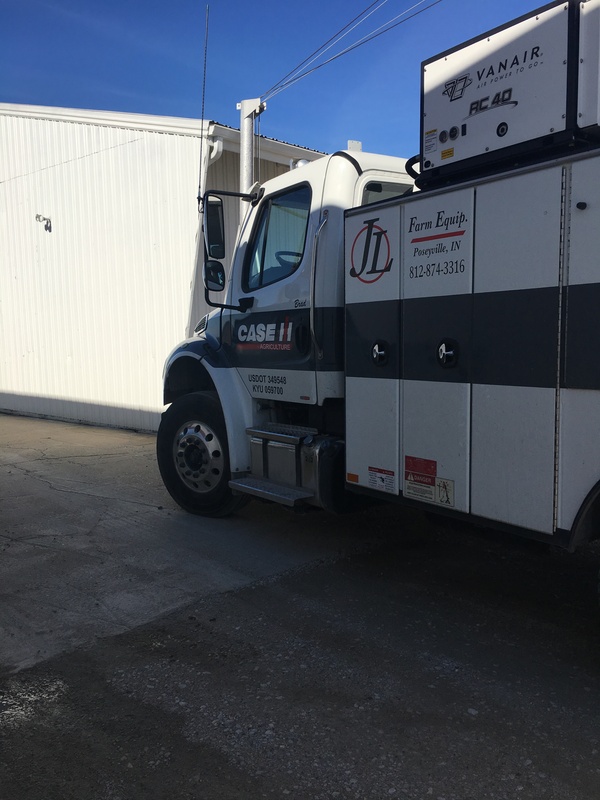 Brad’s service truck. With this, he’s ready for just about anything. Brad plugs in his computer to the tractor and performs the software update. Only then can the tractor communicate properly with the planter. Now that the MX290 has updated software, it can unfold the planter to field position. Ross and Brad can then check the planter for some preliminary operations. There are many new features that must be learned. 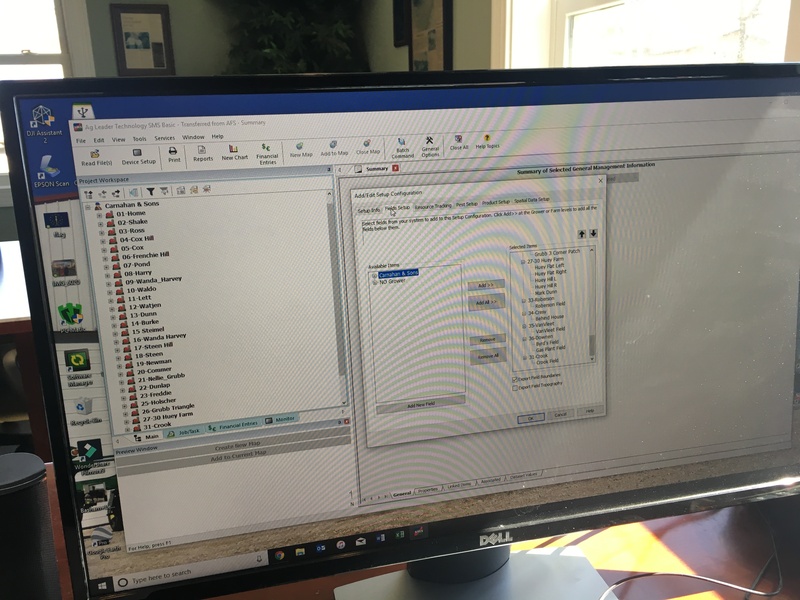 Creating the “Spring 2019” setup files using the “Device Setup Utility” in Ag Leader SMS. Also, we heard from our seed dealer, Jeff Jackson, and he has begun the seed treatment of our Asgrow soybean seed. That work is accomplished at our nearby Nutrien plant. We should be able to pick up our first batch of soybean seed, coated with that pink treatment, sometime tomorrow. We got the Vision truck out today, and thoroughly cleaned the trailer. It is now ready to receive its first load of seed. This is another important step towards #plant19. Brandon fuels up the Vision truck after he has cleaned the trailer hoppers. They are ready for soybean seed. The sunshine sure lifts our spirits today. I read a quote today: “The first day of Spring is not the same as the first Spring day”… I must agree with that one. It’s raining again this afternoon. Monday and Tuesday were quite nice, with lots of sun and calm winds. The temps got to about 50ºF, and so it was pleasant to be outside. Several little jobs got done on those two nice days. The CIH 220 field cultivator was pulled out and given some maintenance. It needed about a dozen new sweeps. The tire pressures were corrected. The folding and lift systems were lubricated, along with the rolling basket on the rear. 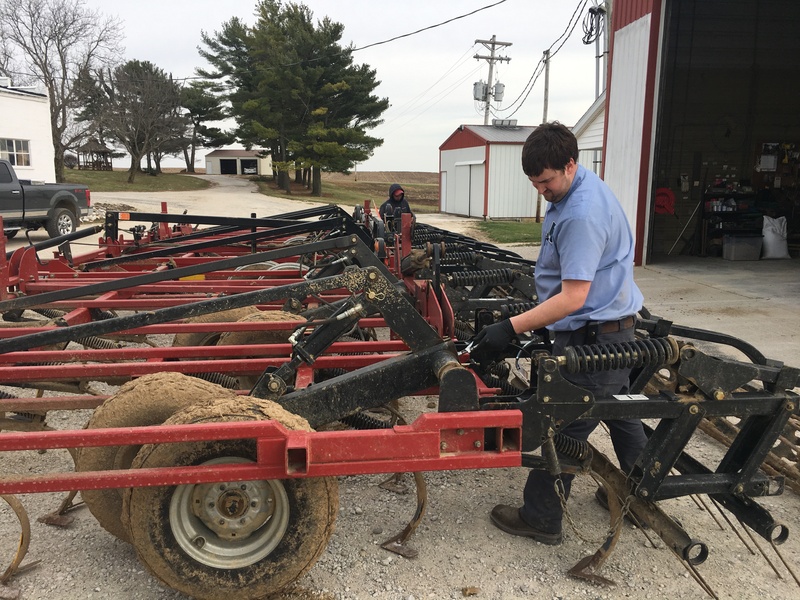 Along with other maintenance tasks, John and Brandon grease the zerks on the field cultivator. In other news, we traded for a new (to us) JD 712FC corn head… one that folds for transport. Now, to move from field to field, I’ll just touch a button, rather than detach the head and place on a wagon to pull end-wise. It should simplify the process of getting from one field to the next. Plus, it’s 9 years newer than the old 612C! We would expect for this corn head to be around here for a long time. 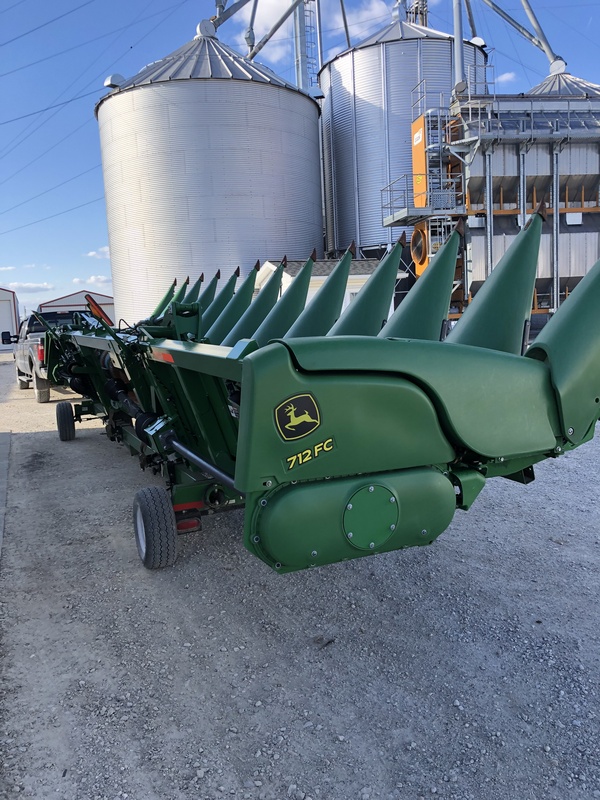 Our JD 712FC corn head is now here. Also, the new CIH 2150 corn planter arrived Monday evening. 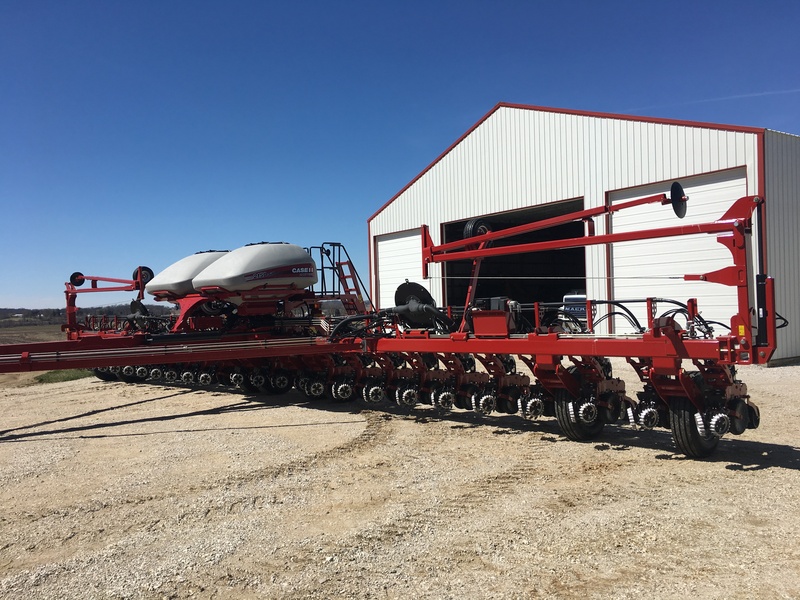 It is the same size, 24-row, 30″ as our previous CIH 1250 planter, but about the only thing that seems the same is the red paint. 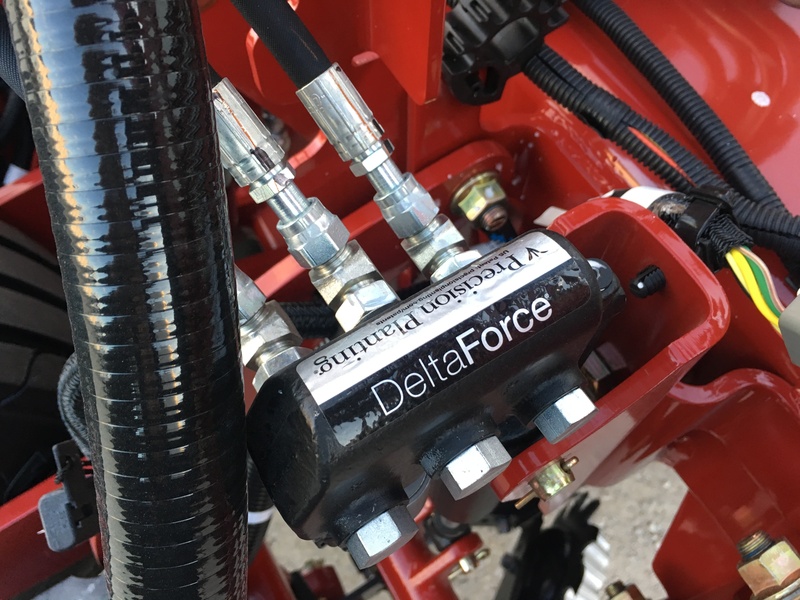 The row planting units are completely different, with individual electric drive, and the Precision Planting Delta Force down-pressure system. The row cleaners are a new style. Even the gray seed boxes are different. We don’t have all the bells and whistles from PP, but this down force system seemed like a very logical improvement. 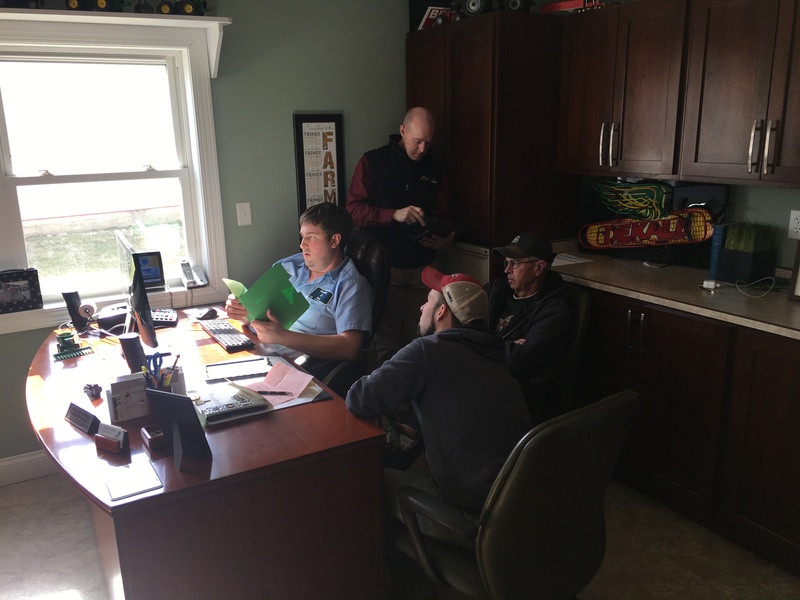 We met yesterday with our reps from Dekalb and Nutrien to discuss a specialized corn planting prescription service made possible through Climate.com. After reviewing their proposal, we are putting this service into action in one large field with highly variable soil types. This new Climate.com feature, called Advance Scripting, utilizes many factors to recommend a presciption–including previous yield histories, the traits of the particular variety being planted, and satellite field health imagery. We will directly measure the results of variable-rate (VR) planting to a static (or single) planting rate. 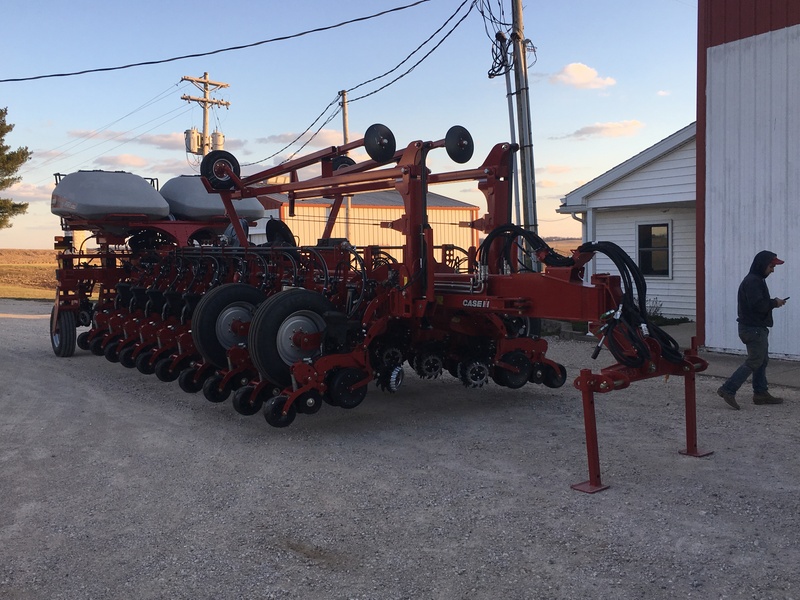 Ross’s new planter will have the capability to plant half-width with the VR, and the other half with single-rate. This will make the entire 170 acre field a test plot to see if the VR brings value. We have been reluctant to use prescriptions for corn planting, because of our inability to quantify its effects. 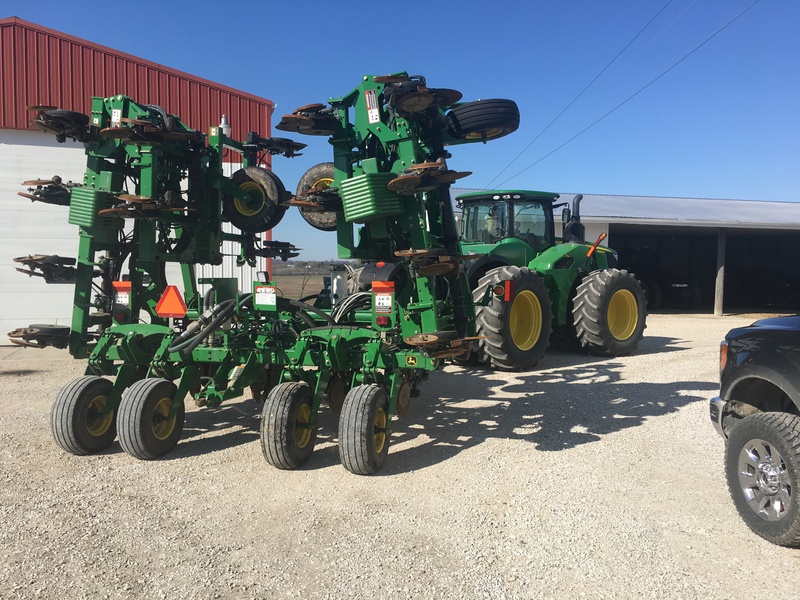 But with this new planter and FieldView technology, we will be able to determine just how much value VR brings to our corn crop. Our DeKalb consultant–Troy Clawson (background)– advised John, Brandon, and Ross on the creation of a specific corn planting prescription. Brandon used the two good-weather days to repair tile holes. These occur when the underlying drainage tile develops a defect or hole, then the soil erodes away to the surface, creating a ’tile hole’. He uses the backhoe and a hand shovel to reveal the problem, then uses some plastic tile to repair the defect. Then, the excavation is refilled, and voila! no more hole. In this case, Brandon uncovered a broken “Y” clay tile. He had to reconnect 8″ and 6″. 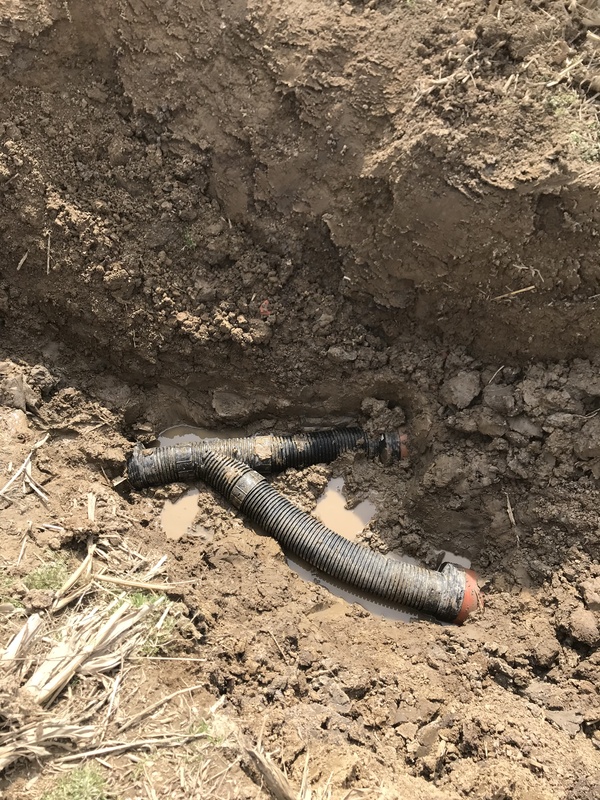 Of course, he used plastic drainage tile and connectors to make the repair. 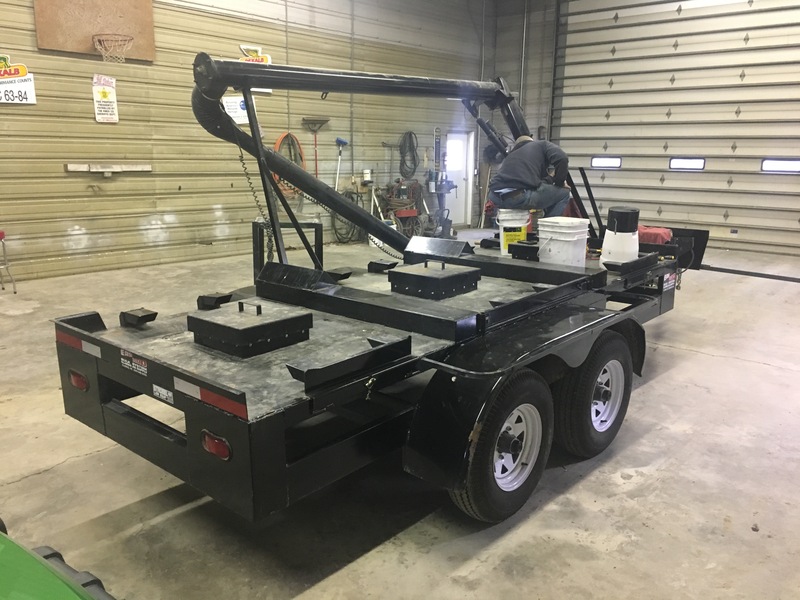 Because it’s raining outside, John and Brandon are working in our shop, fabricating a metering dispenser to add the talc and graphite seed treatment to the auger delivery system of our Easi-Load seed tender trailer. 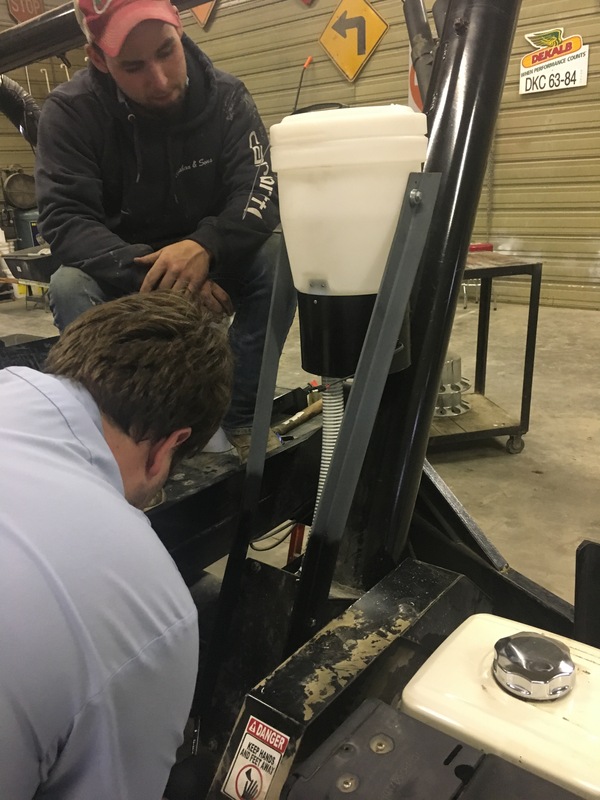 Rather than dumping talc/graphite mixture into the top of the planter seed box, this will more uniformly distribute this seed treatment throughout the planter’s seed filling process. The talc/graphite is a type of lubricant that improves the flow of the seed through the planter’s vacuum metering system. 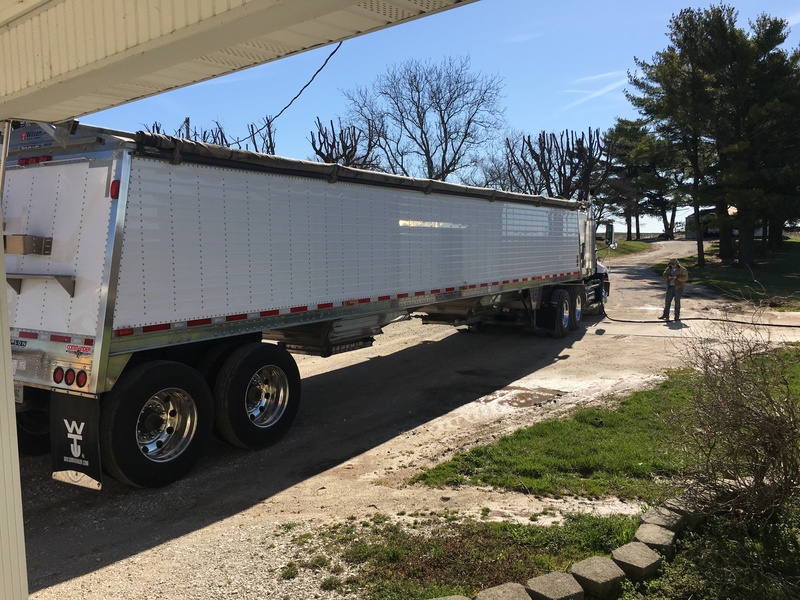 This seed tender trailer holds 3 50-unit boxes of seed corn. The guys are adding that talc/graphite metering gizmo to the vertical auger up front. A little more paint, and some wiring, and this accessory will be ready to roll! Looking at the calendar, it’s telling us it would be nice to begin some field work. But, as always, we will use the days that we are given. There is rain in the forecast off and on through next week. Any field work in March is like a bonus, but once April arrives, we like to get going. Just remember in 2018, we had snow in mid-April… and we were able to get the crops planted in a reasonable time anyway. So, we will see what comes. The One who knows what weather is coming is not telling… He just wants us to trust Him. I think we are pretty much ‘ready’ for spring field work.